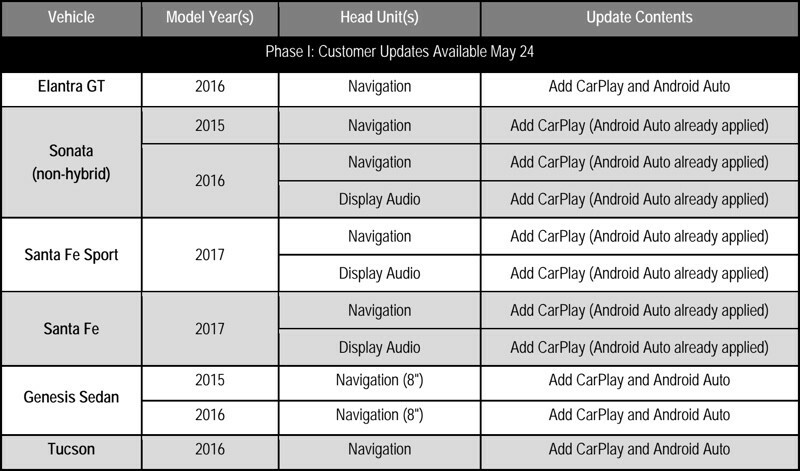 Hyundai is releasing a software update that brings CarPlay support to eight new vehicles, including the 2016 Elantra GT, 2015 and 2016 non-hybrid Sonata, 2017 Santa Fe Sport, 2017 Santa Fe, 2015 and 2016 Genesis Sedan, and the 2016 Tucson. The vehicles gaining CarPlay support through a software update join Hyundai’s previously announced CarPlay models, the 2016 Sonata, 2017 Elantra, and the 2017 IONIQ. Hyundai has not officially announced the news, but dealers were sent a notice about the update on May 19. Dealer information suggests the update is supposed to be available as of today, May 24. Hyundai owners with an eligible vehicle can download the CarPlay update through theHyundai website and are encouraged to go through the installation process themselves. A Mac or PC with an SD card slot or an external SD card reader is required to download the software and transfer the update to the vehicle’s in-dash system. Software download times range from 25 minutes for Display Audio to more than three hours for Navigation if a map update is required. CarPlay took several years to roll out to new vehicles, but there are now dozens of 2016 and 2017 vehicles available with CarPlay support. Apple maintains a list of vehicles that come equipped with CarPlay on its website, which sees updates every few weeks. Update 5/25: Several MacRumors readers have confirmed that the CarPlay software update is now available for eligible vehicles.